Given the polarizing nature of his comedy and public persona, people tend to fall into two camps on David Cross: they either think he’s hilarious, or think he deserves some deep discomfort or pain. 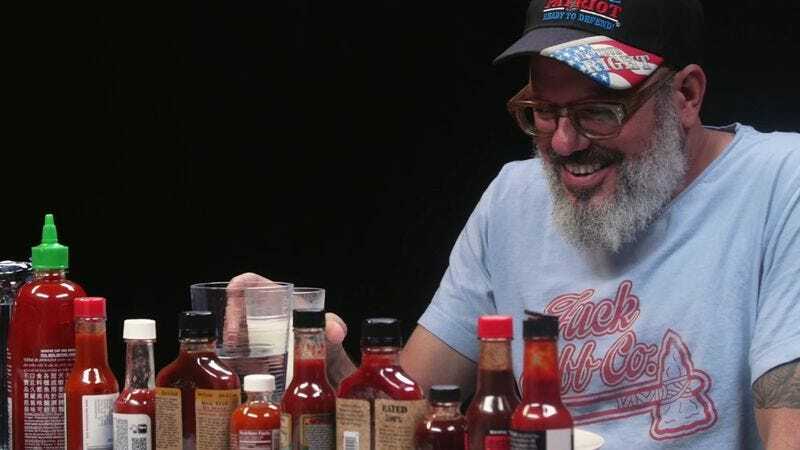 Now both sides can get what they want, with Cross sitting down for First We Feast’s Hot Ones, the show that forces celebrities to answer personal questions while eating increasingly spicy wings. Interviewed by host Sean Evans—who apparently has an iron tongue, calmly sipping milk and plowing through increasingly vile hot sauces with ease—the interview touches all aspects of Cross’ career, from his Making America Great Again! Tour, to Mr. Show, to Arrested Development and the cripplingly difficult mission he voiced in Grand Theft Auto: San Andreas. It’s a pretty fun chat for Cross fans, especially as the heat piles on. And hey, if you don’t care for Cross’ politics or comedy, you can still watch him writhe as he inflicts himself with increasing doses of pain.